Repressed. L'Orchestre Kanaga De Mopti is one of the best West African modern orchestras which originated from a wide range of state funding. In 1977, the Malian government-owned label Mali Kunkan released a series of LPs including this Holy Grail of Malian music, now fully remastered and available again via an official reissue! In the 1960s, during the First Republic of Mali, modern orchestras were encouraged and promoted by Modibo Keita's government. Starting in 1960, Bani Jazz became the city and region's main orchestra before the name changed to the Orchestre Régional De Mopti in the wake of Mali's Second Republic in 1969. At the end of 1970, the band published its first album under the name of Orchestre Régional De Mopti. This record clearly helped to define Mopti's vibrant cultural heritage under the aegis of bandleader Sory Bamba. Trumpet player, flutist, traveller and songwriter, Bamba already had a strong musical background when he took over the orchestra in 1969. Around 1976, the Mopti orchestra became Kanaga De Mopti, simply known as "Kanaga" by the listeners of Radio Mali, named after the large Dogon ceremonial mask. Under this new and slightly "more commercial" moniker, the band also performed at private functions and for various regional patrons. In July of 1976, after months of intense musical and cultural research, the orchestra visited the Radio Mali recording studio in order to document its new musical evolution. Six of these songs were featured on the only album by Kanaga De Mopti released in 1977 courtesy of Mali Kunkan, an ad hoc label formed around the Ministry of Youth, Sports, Art and Culture. On side one, the infectious "Kulukutu" and its mesmerizing vocal introduction focuses on the celebration and the joys of marriage between young men and young girls. "N'Do N'Do" digs deeper into the Dogon culture as it displays the masked dances and processions performed by kids on Ramadan nights. The call and response add up to the strong and fierce excitement one can sense within the recording studio. Closing side one, with its introductory bell gimmick, "Sare Mabo" is dedicated to the cloth weavers. Bamba plays the traditional fula flute at the end of that track, giving it a rural edge while the sturdy horns display their powers. Side two opens up with one of Bamba's most amazing compositions, "Kanaga," an homage to the Dogon mask and to the dancers who wear it during ritual ceremonies. The brass section is exceptional all throughout the record with tremendous riffs on that track. Electric guitar and organs swirl effortlessly around the melodies on songs like "Gambari" (trans. "green grass"), a griot-like song praising a powerful groom. "Sory Bamba" is another praise song which extols the virtues of its famous band leader. Stuck in the past but looking towards the future with its incredible mix of traditional and modern instruments, Kanaga instantly reaches the higher level of African music classicism. Finally, this timeless classic is available again including fully-restored artwork and audio. 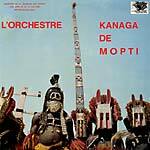 Also includes in-depth liner notes about Mali and L'Orchestre Kanaga De Mopti.